This is the old hunter tier 3 from 40-person Naxxramas at level 60. It is no longer obtainable. This is the old hunter "tier 3" set from the level 60, 40-person Naxxramas. As the instance has been re-tuned for level 80, one can no longer work towards obtaining it. 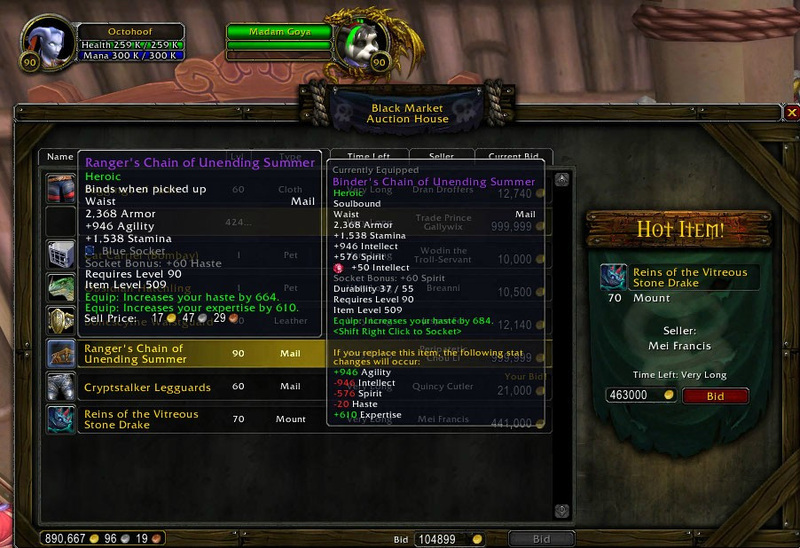 Items like these vanity tier 3 that are no longer available within game may be returning in MoP as random bid options in the Black Market Auction House. It is confirmed by Wowhead: Info from this news post! Will cost a total of about 80,000 gold if you are the only one bidding on the item. All pieces are available at 10,000 when they are up on the black market. Keeping my full Tier 3 armor in the bank all these years was worth the space. It is one of the few items you can transmog that hardly anyone playing today will recognize and many will ask you "where did you get that armor? ", simply because it's impossible to acquire now save for the Black Market Auction House. For those needing a bow to match it, I recommend the Soulstring model available from Instructor Razuvious in Level 80 Naxxramas, Accursed Bow of the Elite matches the bow model that used to drop off of the Four Horsemen in Level 60 Naxxramas. Arc long de réserve d'Hisek the purple a nice match and the mantid style fits the nerubian style of the set. Cape de maîtrise the cloak matches nice in color and even is accurate to the raid original T3 came from. Tabard de bataille aile-argent or Tabard de la défense sha'tari for a taberd. Although you can equip it, it WILL NOT count towards your transmog collection. It MUST be on a Hunter or Shaman. I can't find the tweets confirming this, but it's just how to transmog system is so far. CONFIRMED. This could change in the future. So i have now under one year collectign this set only miss wrist and shoulders but i think i have been really lucky cus no one seem to bid for it so ovcerall everythign has cost me 100k gold atm but i have never seen the shoulder on stormrage black makret i find that weird. atm i am using Cloak of Mastery as a cloke, Accursed Bow of the Elite as my main bow until i have unlocked Living Longbow, i dont have the shoulders so i am using Shoulders of the Hidden Predator it fit well with the colour of the set overall. This set is overall uniqe for a hunter cus no one seem to use it or have it so i feel uniqe when i use it and i am happy i spend my gold for it i dont have Rhok'delar, Longbow of the Ancient Keepers so having almost full set of this old vanilla set is okey for me.